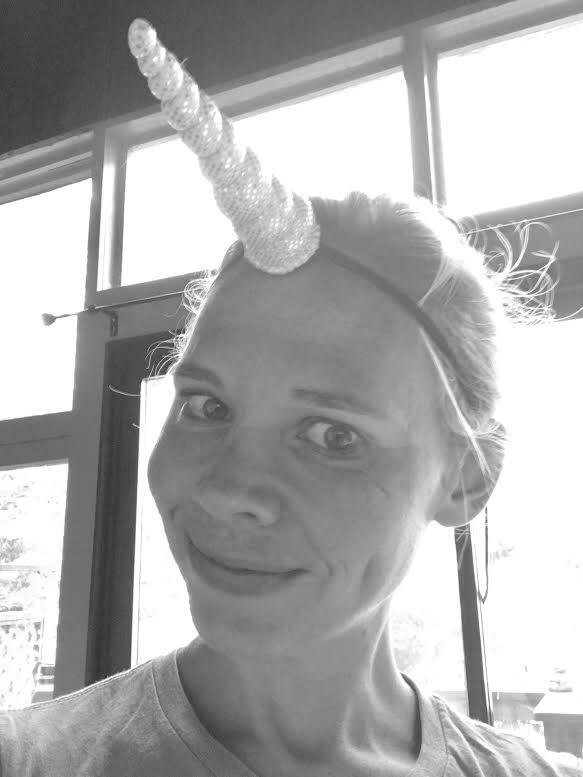 Unicorns aren't just the province of pre-teen girls - or 39-year-old women who buy glittery silver horns and strap them to their head. Unicorns have powerful and sacred energy - and a lot to teach us. Now, I do hear myself when I say things like this. And that's always about the time I ask myself, "Wait. Have I gone actual crazy? After years of impersonating moose and pandas on the internet, of being entirely too attached to a stuffed therapy otter, has it finally happened? Have I officially circled the bend and taken up residence?" I might have. Honest to god, I might. But if I'm going to be in the nut house - whether between literal padded walls or the metaphoric nut house of this ever-more-histrionically-surreal-world - I definitely want the unicorns in there with me. Unicorns ride Harleys past me on the freeway when I'm cranky. Dance conga lines through my head - with extra glitter! - when I need cheering up. Join Jesus on the trampoline at my birthday party, tumbling and flying like equine rainbow gymnasts. When I'm in a particularly human moment and need a lift, the unicorns show up as cartoons - complete with candy colors and goofy horse grins. When I'm tapping in to their energy and channeling their power, they appear as the glowing silvered magical creatures of fantasy. This is when I begin to think that I can't be the only one who sees them. There's a reason they're all over the internet and prancing down hundreds of streets on Halloween. There's a reason so many of us are drawn to them. Even Starbucks tried to blend them up and shove them into a frappuccino. Magical creatures - like unicorns, like dragons, even giraffes - have a profound and sacred power. Hidden for eons because humanity had contracted to the point where we just couldn't handle them outside the realm of zoos and myth and basement D&D tournaments. But we're expanding again. Our darkness is rising up to be seen and felt and, yes, honored. Our light is busting open the seams of this reality so that the reality we've known will never look the same. One thing I have learned - amongst the many lessons I'm pretty sure I'm still missing - is that when I flow with what feels good, life gets easier. And when I let myself be swept away by the unicorn crazy, I feel better. When I resist it, I feel worse. So the path forward is clear. It leads straight to unicorns and the other magical animals I've been channeling. Am I crazy? Maybe. But aren't we all a little crazy? Even those of us with relatively normal-looking lives - something I profoundly wish for on occasion - have some crazy in us, whether it's latent, emerging, or flying proudly on a flag. Fist bump to everyone who's ever felt crazy! While wearing a unicorn horn or not. Go softly and gently into the darkest time of the year. Winter solstice is when you feel the light you have within and allow it to reflect out into the world, for these dark times need all your light. Your light is what will shift us out of the dark. It takes only you. It takes only you recognizing your own light and turning it in the direction of any darkness you see. Even the blackest night can be lit by one small match. As you shine your light into the dark, others will be inspired to shine theirs as well. This is how we light the world. Fear grinds slowly and painfully or hot and quick. Fear is that subtle sense of danger, that roiling blackness in your diaphragm or running rampant through the folds of your brain. But fear is a choice. You can choose to give your energy to fear and its agenda or you can choose to ask what purpose that fear now serves. Is it to keep you out of clear and present danger? Did that quick sense of danger prompt you to jump out of the way of a speeding bus? Or is that fear the product of some long-ago decision or some family system? Ask if that fear is necessary now. Ask if feeling that fear is in your highest good. The answer you get back will probably be a soft but firm no. But whatever answer you receive - listen. Question it. Fear doesn't like to be questioned but your higher wisdom adores it. Your higher self, the self that has access to so much more information and assistance and knowledge and wisdom than we can imagine, wants you to question it, to ask for what it can share, what it can offer you. It lives for this. It loves it. It wants you to understand more fully what is truly available to you. Fear wants to stifle. Wisdom longs to share. So if you're ever in doubt - fear or wisdom, blocks or intuition - ask yourself how it feels. Does it feel open and expansive? Or does it feel like it's pressing in on you, forcing you into a box, telling you to take up less space? Does it welcome your inquiry or does it want to shut you down? Fear dissolves in the light of your true self. Fear disintegrates when you shine in its face. So do whatever it takes to light yourself up, to shine fully. Because that will show you that what you fear is only a shadow. Sometimes things happen that we don't know how to handle. This is a part of life. You handle it the best you can in the moment, you ponder what else could be done later, and you move forward with the lessons you've learned. Nobody knows how to handle life at all times. Nobody has all the information they need at all times. We all have connection to the source of the best information we could have, but it can sometimes be hard to tune in at the precise moment you need it. With practice, it gets easier. Trust that every action that comes from your best self is enough. Trust that any help you offer is enough. Trust that you are enough. Trust that you being you in this world is the best thing for all of us. Usually I type the channeling and pretend I'm a giraffe, but sometimes I have to admit I'm a human and use my vocal chords instead. Gentleness. Tender care of your life, your body and your soul. It's easy to push forward, to try to get ahead, to attempt to cheat time and move faster than you're meant. But this road only leads to fatigue and burnout. Nourish yourself. Care for your home, care for your body, care for your emotions. Ask yourself, What do I need today? Wait for the answer to rise up in you. If nothing comes, ask yourself, What do I feel drawn to today? What would I do today if the factors of time, money, and what-I-think-should-be-happening didn't exist? Whatever comes to you, investigate it by asking if this would truly feed your soul and your body. If the answer is yes, allow yourself the space to do it - even if only for a short time. You are worth it. Your life will shift into greater happiness and alignment as you expand into what brings you joy and what feeds your spirit. His story is not your story. Her story is not your story. Your story is yours alone. Yes, you share your story with others, others play a role in your story as you play a role in the stories of others, but you are ultimately responsible for your own life and how you view your life. You have power over your story. Yes, you can be hurt. Yes, you can be sad and afraid and worried. That can be a part of your story. Once you have allowed your feelings, heard them, asked for what they have to share with you, your story is allowed to change. You are allowed to change. You are allowed to feel what's sad, feel what's painful, feel what's hard, you're allowed to rage against the universe, and then see what that release brings you. Once you send your pain and your fear out into the air, into the space that is meant to take those feelings and transform them for you, your story will change. Listening to another's story without judgement, without equating it to your own story, is one of the best services to humanity we can provide. We all want to feel heard. To know that our story matters. To know that our story matters every bit as much as another's story. To know that your story does not negate my story, even if we have different experiences. This does not mean we are required to forgive the unforgivable or sacrifice our own wellbeing on the altar of another. It simply means that we release that which does not serve us so that we can focus on the sweetness of life, the tart lemon of experience, and the heady joy of swirling it all together. Every person's story matters. Every voice is crucial. Every life is a light and when we can accept our own light and the light of our fellow humans, that light will power the universe. When you're flying apart - not in a dire way, not in the life-has-just-crumbled-around-me way - but when you feel like you have too many things to do without sufficient clock-time to do them. This is when you sit quietly for five minutes. Yes, it feels like the absolute very last thing you should be doing. But this is when it's most important. When the world is tugging insistently at your hem, you need to sit down and listen to you. What truly needs doing now? What's your best next step? How can you care for yourself when so many things are happening? These are the questions to ask and, if you listen, the answers will become clear. Allow yourself the space to expand your ribs with quiet air and the time to allow your brain to draw in all its thoughts, pull them to the center of your head, and drop them into your heart space. In that moment, you can allow your heart to lead you into what needs to be next. It may be the next thing on your to-do list, it may be something entirely unexpected. That quiet voice inside you may say, Now is the time to work. Or it may say, Now is the time to rest. You may even get lucky and hear, Nothing you do today will turn out well until you take the time to walk on the sand or shift your feet in the cool grass. If that voice tells you to do something, life will be smoother and kinder if you do it. If you're worried about listening to the wrong voice, use your feeling center as guidance. Does the advice bring you peace? Or does it make you agitated? If you feel agitated, you're probably listening to fear or one of a hundred voices in your head and your life that have their own agenda. If it makes you feel peace, then it is most likely your intuition. If you still aren't sure, ask for confirmation. If it still feels haywire and awry and you're not sure what to listen to or what to pay attention to, that's okay. Intuition is a muscle - the more we use it, the stronger it gets. Five minutes every day will take you far. And it may take a mere five minutes to realize that your to-do list isn't the hell-frazzle you suspected. Maybe it's now full of ease, even joy. Our job as humans is to respect the other humans around us. Respect where they are, respect their choices, respect who they want to be. It is not for us to judge, even though we do, because we're human. It's not for us to make them wrong, for any reason. Though we will, because we're human. Being human means fighting the lizard brain, the one that prompts us to filter and categorize based on what we see as helpful and safe. Our survival instincts our strong. But now that it is no longer a matter of survival for most of us, we need to rise above our quick decisions of who is worth our time and who isn't. Who is worthy and who isn't. Who is capable and who isn't. We need to trust that what is on the surface isn't all their is. We need to trust that everyone truly is fighting their own battle, and that battle is probably remarkably similar to our own. We all crave love and connection and security. We all want to reach our potential, we all want to survive this place, we all want to find what we're looking for. We all want to, eventually, stop looking. We do what we need to do to decide who we want in our life and who we don't, but under each decision must be a deep, fundamental respect, no matter what their life circumstances, their bank account, or the measure of worldly power they can claim. What we judge in others is often what we are judging in ourselves. How we measure the worth of another is often how we're measuring ourselves. Everyone here has the same light you do. And it's the responsibility of each one of us to uncover that light. Allow yourself to stop hustling. Allow it to be okay to step away from that ceaseless, soul-sucking grind of proving yourself to others. Your own view of your worthiness is all that matters. Since the mantra of "worthiness comes from within!" is less than helpful, here's how you can truly feel the worth that you were born with. Removing the numbing layers and piercing wounds around your self-worth will show you that you are every bit as valuable today as you were when you arrived. Step into yourself and ask when you first felt unworthy. Were you a child? Is some memory or age called up? Go with whatever pops to mind and travel back to that moment in time. Ask the parts of yourself that know how to do this to heal that wound. Ask that healing to travel from the moment the belief was formed all the way to the present, where you stand now. Feel this as it happens. When it reaches you here in the present, extend it into your future, a future where you truly feel your full, intrinsic worth. Ask if there are any other spots in your life or childhood where you felt like you weren't enough, weren't worthy, weren't whole. Go back in and allow the parts of yourself that know how to do this to heal each one and extend it up the line of your life to the present and into the future. Give yourself time to integrate. Give yourself time to notice that you are worth everything and there is nothing that can be held from you if you choose to reach for it. Let yourself see that when you radiate worthiness from within, the outside world can't help but reflect it back to you. This is when the hustle becomes either obsolete or so joyful that you're eager to dive in. If you want something new, ask for it. Don't ask some external authority for what you want. Ask yourself. Ask yourself what you truly desire, what you truly need now. Ask what your soul needs and what your life needs before you ask what your bank account needs. Ask what will bring you joy now. Even if that joy doesn't make any sense in the quote-unquote real world. Sometimes the joy of walking a friend's dog while they're stranded on the couch with the flu will take you into a new part of the city, where you meet just the right person. Sometimes going to the fancy grocery store with the best peaches will introduce you to some new idea that will lead you somewhere you couldn't have imagined. Joy is like a breadcrumb trail toward what you truly, deeply desire. If you follow the small bits of joy, they will lead you somewhere so much greater, even if you don't understand the path. Especially if you don't understand the path. Trust where true joy leads you. Trust that if you spend a weekend making something you're excited about rather than updating your resume, it really will help you on your job search. Trust that when you're taking care of yourself, you're also taking care of your loved ones. Trust that when you allow yourself to feel joy, other wonderful feeling things can't help but be drawn to you. Joy is magnetic. Joy will alchemize the world around you to begin providing you with what you need. So ask yourself again, what do you want now? What would you like to be fresh and new in your life? Feel how that might feel - feel the joy, the safety, the love, and the lift. Follow that feeling and trust that it's taking you precisely where you need to go. When the blue sky calls. When love notes need writing. When summer sun beckons. When something else sounds like more fun. When your favorite person lights up your phone. When night is falling and eyes are drooping. When you know that you already have everything you need. When you realize, finally, that it's not about doing - it's about being. What doesn't feel right is an opportunity for investigation. All too often, we don't listen to our feelings, our gut instincts, the sensations in our body. Sometimes those physical sensations are subtle - a slight pressure on the chest, a warmth in the belly, a tingle in the hands. Sometimes those physical sensations are a spiritual approximation of a mallet to the head. Sometimes it actually is a mallet to the head. (Try to avoid those.) But our feelings and sensations are information. Not information that tells you, "If it feels bad, don't do it." For that is not always the truth. Sometimes it feels bad because you have emotion or circumstances to process to move forward. Sometimes it feels bad because there is resistance that you must conquer before you can continue. Everything you feel is an opportunity to know yourself better, know yourself on a deeper level, to develop a new relationship with yourself. For example, if you feel something pressing against your chest, give that feeling permission to leave. If it doesn't leave, ask it for its message. Allow yourself to hear the answer, whether it appears immediately or takes a bit of time. Feelings and physical sensations are a way to glean information that can't quite penetrate the walls of our brain. Our brains can only repeat what they already know, so if new knowledge needs to find you, it won't always choose your brain as its best point of entry. Your brain may ignore something, but your body never can. What is money? How does it come to you? Money is just like everything else - a flow. We've assigned it great importance because in this world we've made money mean security. Money to most of us means a roof over our head, food in the fridge, and a sure future. But money is no different than anything else. Money begins in your mind. Money shows you the truth about yourself, about what you've made the flow of your life mean, where you are and aren't allowing yourself to receive. Love flows to you when you let yourself feel love for what's around you. Peace flows to you when you decide it's okay to feel peace. Money flows to you when you've decided that you can allow yourself to have what you need, what you want, what you truly desire. Money heightens these lessons because we've attached so much importance and so much of our wellbeing on the amount of money we have. We choose the amount that makes us feel safe. Some feel safe with ten dollars, some feel safe with ten thousand or ten million dollars. It is arbitrary. Money is arbitrary. Money is not our security or our savior. Money is only a means, a means to know ourselves better, a means to get what we want. But money is not the gatekeeper to love or security or freedom. We can have these things with or without money. Money works best when we share something we value - our art, our time, our knowledge - and receive in return. Money is simply an idea, an idea that works best when it feels fun, when it feels like simply another way to accept in the flow. You send out, you accept back, in an infinitely looping figure eight. Care for it, love it, share it, send it back into the world for things you love and value - that's when money can truly do its job. Money doesn't need to be a receptacle for our shame and our fear and our disappointment. It can be, if that's what you require to learn what you've decided to learn. But money can simply be another tool that allows you to play in the world. No moral value or judgment is attached to money. Receiving what feels like a large amount of money for value you put into the world does not carry the weight of "good" or "bad" - it's simply the product of a decision you've made. But the decision can't simply be made on the surface. The decision of what you're worth must be made within your deepest, darkest depths. By accepting and loving those deep, dark depths you can integrate them into the wholeness of your life, your soul, and your experience. When you do not judge yourself or others, you will not judge money. When you do not judge money, you have removed enormous blocks to allowing yourself to have it. Money is like love - it comes to you when you allow it, when you welcome it, when you prepare yourself for it. Preparing yourself for it does not need to take time, it does not need to be another barrier. Preparation is simply something you have previously assigned yourself. If you don't have the money you think you need or want, rejoice. You have just been accepted into the PhD program of your choice and you are about to learn how to conquer the world. As you go through the process of learning how to accept and have the money you would like, trust that you won't be abandoned, you won't be left, you won't be assigned to suffer. Allow yourself to have what you need without money and trust that as you step forward, one step after another, you will learn all you need about money - that it was never about money and it was always about yourself.